Summer this year is officially the longest time i've been staying here in Shanghai. July 17th 2017 and i am still keeping up with Shanghai's heat. The temperature shows for 38 degree Celcius, but the real feel was 49 degree Celcius, crazy right?! I've been avoiding myself to go out in the afternoon for the last couple of days and prefer to stay in the comfy room with cool AC on. But, yesterday i had some motivation to go out since i have friend to go around with. We had a very nice brunch in my favorite place called Chicken & Egg. For Chicken and Egg lovers, this is heaven. Plus they have a really nice cheesecake. Yum. Then we went to some shopping spree in H&M, GU, Zara and i've actually got a few really nice discounted items which i really love !! Especially when it's on sale!!! Later in the evening, we went to Xintiandi to take some decent photos before me leaving for vacation on the 20th. 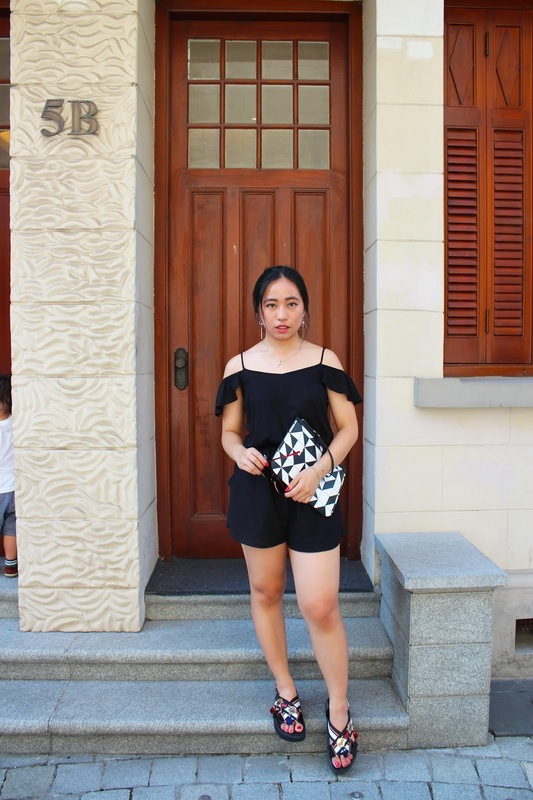 For this time, the heat is really making you sweat and there was no such wind to help you cool down, which is a nice cotton jumpsuit is suitable for me for the day. Off shoulder look with a touch of cut-out and ruffled really helped to make the garment look nicer and with style. 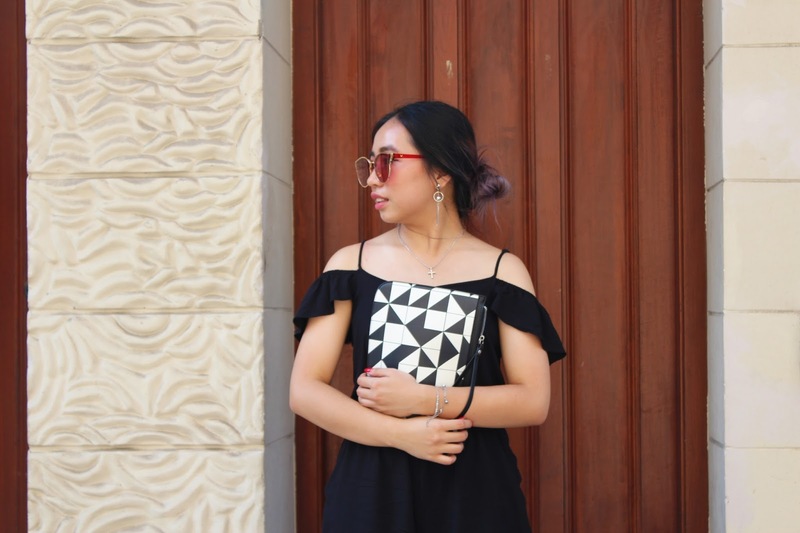 Plus, the fit it's just perfect and shoulder bands are adjustable for both sides. 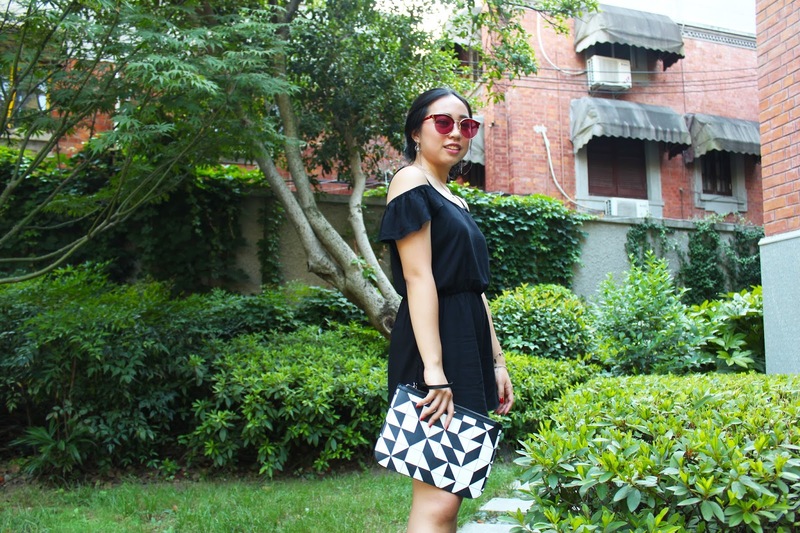 Simple black with a bit geometrical pattern for my messenger clutch worked well, and to add a little bit color, this red sunglasses is my current favorite whenever i feel like dressing down. The frame is quite big and covers the whole part of your eyes, especially when you are avoiding the sun. 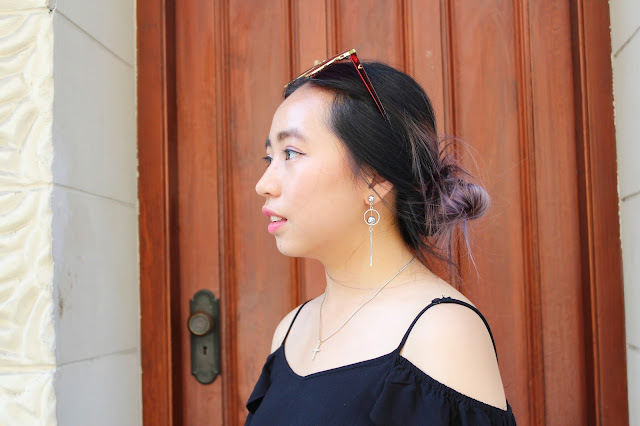 Then, i got the item that i could not take my hands off, which are statement earrings. You have no idea how much i've spent on earrings alone. I like the shape and the effect on how it moves whenever i turned my face. It gives a simple look more sophisticated, and the length is just perfect. 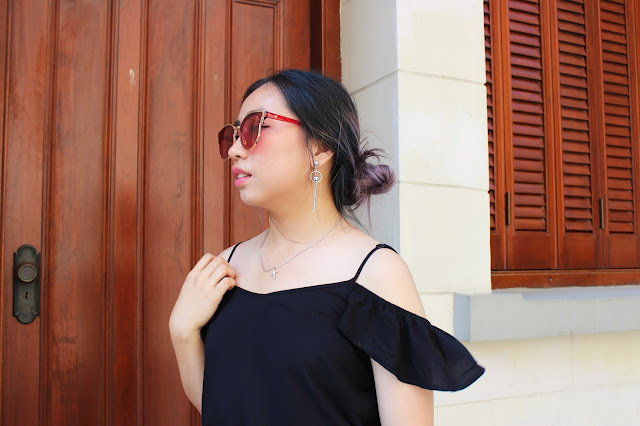 Make sure you style your hair nicely in order to embrace this gorgeous earrings. More sprinkles comes from my feet with this statement sandals. I got it online and i just absolutely love the design and how it comes with many different color combination, different fabric and material to ensemble this sandal, however, the primary color is still black and it looks super trendy and unique. 3 different circle plates with 3 different fabric bundle. Plus, its high sandals, meaning = stylish , taller and comfortable. I just can't wait to go home and spend more time with family and friends! And btw, i started filming more videos again after a long one year of MIA. Don't worry i'll be delivering more great content and wish me luck!